Let’s work together on this. Lots of simplicity bloggers and minimalist bloggers have such a big presence on social media that I wonder just how simple their lives could be. Let’s see if we can develop a sane and simple approach to social media. I’ll offer some thoughts here, then you can have your say in the comments section below. I’ll revisit this topic in a future post and summarize what we’ve discussed. I have no answers on this topic. I don’t use social media very well. Do you? I have about 137Facebook friends who see announcements of my new blog posts if they’re looking. And that’s about all they get from me. I read their news feeds and also like pages from my favorite bands, restaurants, theatres, museums and other entertainment options and keep up with special offers and announcements of all kinds. I rarely comment on a wall post or like anyone else’s comments, but I sometimes do. I also rarely mention Facebook to my blog followers. I don’t suggest that any of you follow me on Facebook (although you’re welcome to), and I don’t have a Facebook page for this blog. Most of my so-called friends on Faceboook are distant relatives, high school acquaintances whom I never expect to see again and real people I either see regularly in person or did at one time. When I first started my blog, I went to great efforts to find and follow similarly targeted bloggers on Twitter. I read Twitter updates from dozens of bloggers and other interesting people and often clicked through to their posts and announcements. I’m sure that work paid off a little, getting me some blog followers. Is that how you found me? Today, I never check Twitter, but I announce all of my posts there and also mention posts from some of my favorite bloggers, mostly automatically. Since Twitter thinks my email address is bad, I’m not notified when someone new follows me, so I don’t know if anyone is adding me, removing me or noticing me at all. This blog, So Much More Life, is my biggest online presence and the place where I’m most active online. When you comment here, I respond. When I have something to say, I say it. I don’t tell you what I had for breakfast (usually a protein or fiber bar of some kind) or when I’ll be out of the house on a night when my neighbor’s security lights aren’t illuminating my property very well, but I do say what’s important to me, usually twice a week. This is pretty simple. Although I have a LinkedIn account and probably have accounts with some other sites I’ve forgotten about, I have no other active social media presences. None. Not a one. That I remember. My totally useless and out of control approach to social media is why I want us to work together on this one. A better approach to social media for me would be both simple and deliberate. That means it would be simple enough that it doesn’t take up very much time and deliberate enough that it actually satisfied a need in my life — like promoting my blog, deepening my relationships, connecting me with new people or gaining me quality information, for example. Do you have a comprehensive social media plan for your life — or is your social media a hit-and-miss affair that’s sometimes fun, sometimes useful and sometimes a time-waster? I don’t like wasting time, so I won’t settle for a social media plan that takes my time without returning anything useful. I’ve heard of people who improve their blogs, their money-making opportunities and their social lives with social media, so why can’t I be one of those? Why can’t you? Let’s talk this over using my best online tool, this blog. Comments are open, and your opinion is solicited. Sounding off on this post just might be a better use of your time than playing Ranchertown or whatever it’s called. I’m with you, reposting blog headlines on Facebook and Twitter feels less than simple to me too. I keep my social media / internet activity quite segregated. I read blogs on topics I’m interested in and respond in the comments when I have something to add. Facebook is mainly for friends and family who live far from me, though it’s easier to chat with some people in town there as well. Sometimes I question if I need Facebook at all though, but it’s an easy place to share pics and whatnot. I tried Twitter, but the frequent updates made me more dizzy than anything so I stopped using it months ago. I just didn’t get any value from Twitter. I also use LinkedIn, but solely for networking. But then again, I’ve always been weird. I’ve always been weird, too, and I remind people of that at every opportunity. I don’t see much value in Twitter either. Facebook is quite enough nonsense for me. But I’d like to hear other opinions about how Twitter adds value to life. I found your blog through your comment on someone else’s blog. And from what I have learned through researching how to start and monetize a blog and have it be successful, it turns out that those with those kinds of blogs spend more than 8 hours a day creating a web presence, using all kinds of social media, tweeting, commenting, following, yada yada. I don’t care what they say. All that so-called interaction is just faux camaraderie done to boost readership and thus hopefully sales. I hate fake. Authenticity is harder to achieve than one would first think. Endlessly tweeting, FB commenting, and marketing one’s minimalist blog does seem rather hypocritical, doesn’t it. Minimalism is not what is in your house. It is what is in your head. I like your style. And I really like how you feel about comments on blogs. Which is why I follow you. I don’t like fake either. And you’re right: Social networking is almost a full-time job for some money-making bloggers. I think you will like my Friday post about ebooks too. Let me know. Marti, I know *exactly* what you’re talking about. I absolutely hate, for example, when somebody posts “how can I help you today?” on Twitter – when they really don’t seem to be intent on helping anybody. “How can I help you?” should *NEVER* be a rhetorical question. I interact *a lot less* than most people on Twitter and Facebook, but when I do interact I try to make it meaningful. And that’s the real key, I think. Social networking is a tough one (for me anyway). I’ve had a personal Facebook page for a few years – initially to keep in touch with a friend of mine who moved to Trinidad. I rarely look at my FB page, or comment upon it – I have less than 40 friends on there and to be honest would like to reduce that further – but how do you do that without causing offence? Occasionally I get bizarre requests to befriend someone who didn’t like me at school 🙂 presume they are being nosy about my life, or want me to be impressed with theirs – don’t know the answer to that as I never accept those requests. In fact this example sums it up – I had an ex-school ‘friend’ ask me to be their friend on FB and then walk straight past me in town (they didn’t recognise me – or chose not to have a traditional interaction with me – speak to me in person). Now when it comes to my virtual life as Simply Being Mum I think it serves a purpose – because this is my digital self (sorry to start using all that terminology!). Kindly Robert Wall sorted my page out for me – as I was struggling to do it. I can definitely see a future for my SBM facebook page. Twitter – ‘aye sure. It’s good for quick communication with a key number of people, but the long one-sided dialogue is a little odd IMO – and hard to identify what you should be reading. However I have an account because it’s very simple to use and blog posts get fed in automatically, and everyone else does. It’s all so new and in it’s infancy – I presume we’ll all evolve along with it? Question for me is where does Google Plus fit into all of this? Another tool to get the hang off…. I enjoy reading announcements of events on Facebook, but I don’t find it very useful for anything else. It’s largely advertising with some useful content. I’m hoping someone can tell me how it’s useful. My wife got me into Facebook. A large portion of her family is on there, so I can keep vaguely up-to-date on what’s going on with her side if I check FB once a day. I have a couple of friends on there too. Every now and then I see an interesting discussion and ask a question, but I don’t know that I’d call it “useful” in the sense that, say, a hammer is useful. 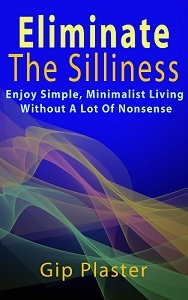 I could live without it, but the minimal amount I use it doesn’t detract from my life – and it does bring some benefit. Facebook’s games are from the 7th level of Hell though. Just FYI. If I played those, the entire equation would be different and I’d be wasting obscene amounts of time on it. Great subject, Gip. I’ve always wondered why self-professed minimalists would choose to spend their valuable time on social media — it almost seems hypocritical in a way. I don’t even have a Facebook account, and rarely use my personal Twitter account. That said, they probably make for useful channels for notifying readers of new blog posts, at least that segment of the blog-reading population who can’t or won’t use email or RSS. Most blogging software can automate this task; once set up it will automatically tweet or (what is the cutesie name for a Facebook message?) each time you publish a new post. Even if it doesn’t, it would probably take less than a minute to do manually. I suppose that as easy as I’ve made it seem, I should have sold myself on it by now, but I haven’t. Why not? My goal is to reach thoughtful readers who appreciate my writing or are interested in the topics I write about, and I’m not sure that the cluttered walled garden of Facebook is the right place to find those readers, and I don’t think Twitter’s environment of rapid-fire short messages is a good match either. My compromise is that I do have social networking buttons on my blog, so if any of my readers want to share a post with their social networks, I’ve made the task easier for them. You make a good point about Facebook not having the right readers or at least not having readers in the right frame of mind to enjoy blog posts. I’m trying to develop a social media plan in my head to present to everyone later, but it’s not coming together yet. “Having the right readers” isn’t a universal truism. Facebook may not have the right readers to enjoy *your* blog posts, but it may have the right readers to enjoy somebody else’s – or vice-versa. The question is, who reads your blog? Who do you want to read your blog? Now….are those people that you’re targeting on Facebook? If yes, it makes sense to interact in Facebook. If not, it doesn’t. I’ve noticed that if I want to connect with other bloggers, Twitter seems to be a good network to be on. But if I want to connect with the less tech-savvy readers, Facebook is where they hang out. I do use both Facebook and Twitter and find them to be helpful in getting to know readers and other bloggers. It’s easy to see Twitter as a way to simply broadcast or promote your work, but really it’s most effective when individuals use it to engage each other. I’ve met some really great people through Twitter. Facebook can be used to engage readers as well. What I’ve found it that some readers prefer to comment or participate on Facebook, while many bloggers prefer to communicate with each other through Twitter. And of course the comments area on our blogs are a welcome place to interact. And I’ve recently started using Google+ as well. I understand what you’re saying about it taking a lot of time to manage the different social meda outlets available. It’s because of the time needed that I don’t do as much with these social media mediums as I could. But, I’ve received so much value from the time I have invested that I plan to continue participating for the foreseeable future. I’ve investigated Google Plus, but I’m not involved yet. In fact, I’m seriously considering pulling back on my social media activities. I just don’t see the benefit that others do. I’m glad someone finally said something positive about social media, however. My readers don’t seem to be big fans of it. So this is where the weird people meet. Glad I found ya’ll. I joined FB in May b/c a friend kept bugging me about it and now she fusses b/c I rarely go in there. I definitely do not want to mix my writing with old friends and people who love FB. And I’ve never twittered. Those sites are just not for me. I don’t know enough about Twitter to say good or bad. I have seen instruction saying to go to many blogs and become known and do the same with FB and Twitter (make 10 FB friends a week and the same with Twitter) but that is too fake for me. It probably does work for some but I am here to write and do it genuinely. I do want to make money also. I am working on using the huge amount of time I spend online wisely. I love finding places (like this site) where I can learn and I feel a connection. While I was working on my first niche blog recently I kept thinking, “why can’t I just have one site and put all my interests on separate pages? I know this is quite “unusual” compared to the majority of advise I’ve heard to have 10 to 15 niche sites on your different topics of interest. What do ya’ll do? I recently read (was it on this site?) a writer that is doing exactly that. I do not plan to put ads on mine in the beginning. I’ve only done up front writing and published some essays “off line”. I would like to build up residual earnings. Well I’m here to follow and voice my opinion. I would like to find a place (here?) to socialize and get and give advice since we are all more or less heading in the same direction. The problem I’ve found with sites about how to make money blogging is that it’s hard to tell whether the person writing the site is sucessful or simply WANTING to be successful. I don’t intended to make money with this site, but I do other online writing to make money — mostly upfront but a little residual income stuff. I don’t have any niche sites at the moment. I’m finding Facebook less and less useful except for planning what events I will attend. And I don’t find Twitter useful at all. So far, only Jenny seems to be getting real benefit from social networking. Maybe it’s the crowd I attract, but I can’t see how these sites are so popular if no one likes them! Joni, you’ve hit the nail squarely on the head. You can’t make 10 friends in a week and actually call them “friends”. Your circle of friends, en toto, would have to be growing by 520 people per year to achieve this. Have you ever heard of Dunbar’s Number? It posits that you can only have a certain number of meaningful human connections in your life at a time. Nobody’s sure quite what the number is, but 150 gets thrown around a lot – and it’s probably not horribly off-base. Think about it – how many people have anywhere close to 150 people that they’re really, truly friends with? And if they’re not trying to be friends, what are they trying to accomplish? There are people that talk about making all these new friends, and then they babble about “authenticity”. Authenticity is deep relationships with a smaller number of people, not surface relationships with large crowds. My blog is young and I am active on Twitter, Facebook and LinkedIn. I didn’t immediately engage in all of these activities, and I only recently created a Facebook page for my blog. I took my time to get on my feet, learn more about these tools, and decide how I want to use them. I decided early on I wasn’t going to use any tool that I’m not willing to actively engage. At this point in time promotion is important to the growth of my blog, but I have received a pleasant and unexpected benefit from engaging in social media- I am building relationships with like-minded people who inspire me. This engagement has improved my writing and improved my life. I do limit the time I spend on social media. I generally only post and read these sites during “business hours”. I allow myself some time off for me. I also use HootSuite to schedule automatic posts to Twitter and Facebook, so I can create good content in batches and have it automatically posted for me on a schedule. I don’t feel compelled to read every tweet and status update on my feed. Instead I skim what’s there and make sure to re-tweet and comment on a few items per workday. And of course I reply to all direct messages and mentions. Thanks for sharing your approach to social media, Chrysta. You seem to have the most organized approach of anyone who has commented so far. I’m looking forward to hearing from others with a similar approach. I think my biggest tip for Twitter would be to have a small number of people that you’re following, and know why you’re following them. You can’t keep up with 10,000 people, so don’t try. Keep up with people that you’d like to keep up with. I use Facebook and Twitter – I can tweet and post my Blogger posts to FB from a button. It is harder to post my blogs that live on VegSource. Facebook is partly social for me although I have little patience for the “I am eating breakfast” posts. The biggest gift Facebook gives the world is to community organisations and other special interest groups. Oh, and the shared photo space so my grandparents can see their great-grandkids. I thought Twitter would be even more lightweight than Facebook, but it is actually more serious. I learn far more there. People are more likely to post controversial news there. I retweet far more often than I reshare content on FB. Obviously, it depends whom you follow! Very interesting comments, Jess. You’re right about the usefulness of Facebook for community organizations. I follow lots of them. Your comments about Twitter are especially interesting. I attended a free screening of a new, locally-produced film last night that overflowing the 250 seats available, thanks to Facebook and other social media. The film wasn’t that good, but we all came out to see it anyway.